In part three of our farmers market series, we look at the increase in small scale farms and some of the challenges they face. 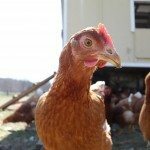 Smaller farms without the resources to butcher their meat or wash their eggs currently have to transport much of their produce and livestock to other counties or states in order to properly process them. But a local farm collective is exploring the shared use of a mobile slaughter house or processing plants, and partnerships with counties and the state seek to improve food processing services. King County Agriculture Policy and Economic Development Manager, Patrice Barrentine, spoke with Yuko Kodama about these improvements and why they matter.